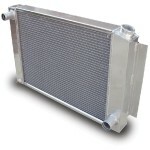 Radiators are heat exchangersdesigned to transfer heat from the engine’s coolant fluid into the air, they are the main part of the cars cooling system. Automatic transmissions cool transmission fluid with another heat-exchange circuit built into the radiator. Radiators are made of aluminum, they have tubes that carry the coolant fluid, a pressure valve and a tank on each side to catch coolant overflow. A water pump, helps the coolant circulate, the coolant is mixed inside the tubes, cooling all the fluid evenly. When coolant is heated, it expands, creating pressure inside the radiator. The radiator cap will act as a release valve when there is too much pressure, allowing heat to escape and excess coolant fluid to overflow into the tanks. Once the radiator cools down, the coolant fluid in the overflow tanks is sucked back into the pump. If you are having problems with your radiator or cooling system, Let our North Attleborough auto repair specialists help you keep your car cool. Advanced Auto Repair offers radiator repair and replacement service, we also offer diagnostic on the entire cooling system.